Named after the president of the brand (and daughter of brand founder Anastasia Soare) Claudia Norvina Soare, this collection of 14 foolproof neutrals and glamorous metallics stars dazzling purple, pretty pink and rich golden bronze shades. We’re besotted by them all – but our hue highlights include lilac-streaked violet ‘Celestial’, glistening pastel pink ‘Wild Child’ and deep burgundy ‘Passion’. 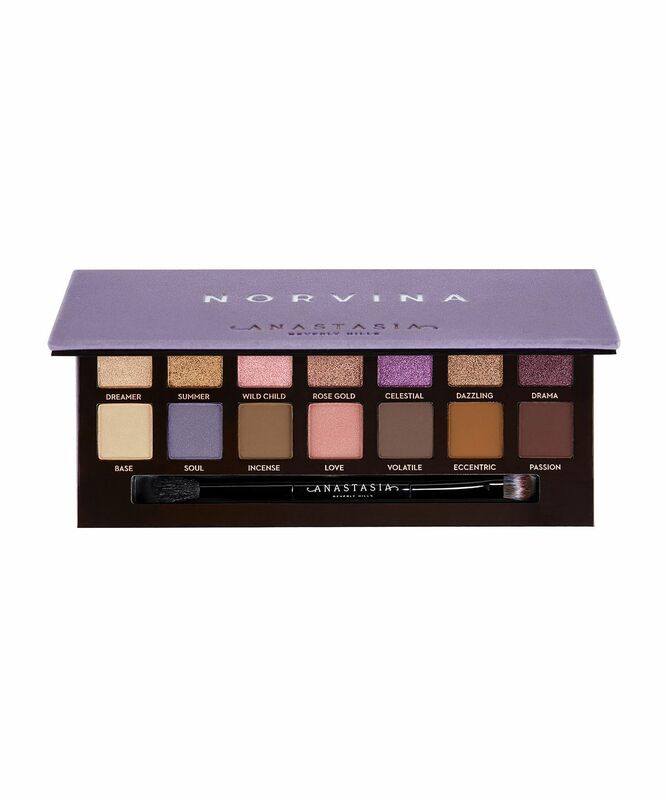 Almost certain to become the most-coveted palette of the season, Anastasia Beverly Hills’ Norvina Eye Shadow Palette features 14 highly pigmented, long-lasting powders in a spectrum of foolproof neutrals, hypnotic iridescents and glamorous metallics. There are dazzling purple, pastel pink, warm golden bronze and soft neutral shades, making this the perfect palette for both day and night-time looks. Based on Norvina’s favourites (she says: ‘it's a compilation of colours that I absolutely love and would use’) this cleverly curated collection that will give your lid looks a new lease of – oh-so enviable – life. Like all of Anastasia Beverly Hills’ adored palettes, this one comes with a large mirror and a super-soft double-sided brush – and the luxe violet velvet packaging makes it even more irresistible. And as for the shades, get ready to fall in love: there’s metallic pink champagne ‘Dreamer’, matte eggshell ‘Base’, metallic foiled golden topaz ‘Summer’, matte wisteria ‘Soul’, duo-chrome frosty pink with magenta shift ‘Wild Child’, matte dusty terracotta ‘Incense’, metallic rosewood ‘Rose Gold’, matte mid-tone cool pink ‘Love’, duo-chrome plum with a violet shift ‘Celestial’, matte warm charcoal ‘Volatile’, duo-chrome cool-toned bronze with a violet shift ‘Dazzling’, matte dark burnt orange ‘Eccentric’, duo-chrome aubergine with a cool bronze shift ‘Drama’ and matte deep garnet ruby ‘Passion’. Apply these high-pigment shadows with the double-ended brush – dry for a sheer wash of colour or wet for added drama or to transform shadow into a liner and achieve more intense pigment payoff. Fast delivery to Kazakhstan, 14 days. Eyeshadow s good. Now this palette is my favorite) Thanks, Cult! I love this palette! The shades in it are amazing (nice combination of purples and neutrals), I feel like they especially compliment my hazel eyes and make them look greener (which is never a bad thing!). Eyeshadows are super pigmented, buttery, of course there is a little bit of fallout, but nothing major that you would have to worry about too much. I bought this product for my sister's 21st birthday and she loved it! It’s got amazing pigment and even though you are paying a lot (which runs through the whole ABH makeup line) you are getting the quality that you have payed for. The shades are right up my alley and a beautiful combination of vibrant colors and neutrals. But the quality does not live up to Anastasia’s usual high standards. The mattes are dusty and patchy. I don’t mind fallout if the shadow is pigmented but these aren’t. The shimmers are so sheer and crumbly. All in all a huge disappointment. I received this as a Christmas present and the colours are gorgeous. They’re chalky and easy to apply and the gorgeous shimmer shades are to die for! This palette isn’t usually one I’d go for when it comes to the colours but I’ve actually enjoyed creating looks with it! Great product. Easy to apply. Best purchase made. Ok - so I'm no makeup guru but I definitely should have checked this out in the shops before I purchased. I am a brown person btw lol. Similar colour to, let's say Halle Berry. Maybe a shade lighter. Anyways, I didn't find the colours really popped on my eyes. Even after using concealer as a base primer. There was a lot of fallout from the shades I used to make the look that I went with and luckily had decided to play around without putting foundation on first. (Yes, I'm one of those awkward ppl who out foundation and base etc on before doing my eye makeup lol) Anywho, I had to constantly keep cleaning under my eye as I also was checking the amount of fallout with each colour I used. I had imagined the purple shade was going to be lighter than it actually was but it was actually much darker. Again, that's down to me not having a check in the shops and swatching it. I think it would have been an even better palette had there been a few more shades (or even one more) shade of purple in the palette. The shimmer shades don't count lol! I'm still going to play around with it to see if I can make it work, but until then, the Renaissance palette is still the best one so far. Brown people.... Get this swatched before you buy! This palette is really pigmented and creamy. The shimmers are amazing and colour scheme is perfect for any look. Sadly this palette is giving me ore eyes, and I have never been allergic to any palettes. It looks gorgeous but I can't use it. The color scheme is amazing. Has everything some shimmers, some matte, Is pretty cool and unique. cool and warm colors in the same palette. Lovely packaging And the brush is very soft especially the blender part Highly recommend. I own all ABH palettes except Modern Renaissance and this one is my favourite. Yes, the shadows are really pigmented but they also blend really well and the metallics are a dream to work with. You killed it ABH! I love the colours, and I love that there are more shimmers in this one. The pinks are especially pretty. There is a bit of fallout and kickback in the pan, so you just have to be more careful handling the shadows, loving the eye looks you can create though. Beautiful colours that are easy to work with! This palette has gone straight into my staples. I have done a you tube video on my channel zero to sixty showing how I got the exact same eye look from modern renaissance as this, minus 4 purples its the same virtually as modern renaissance and soft glam. Lovely if you like purple but in reality you can just use the other palettes and buy some purple singles. LOVEEEEE this eyeshadow palette. So so pigmented and creamy. The mattes and shimmers are amazing. I already own modern renaissance and soft glam and I love them both. Defo recommend this palette. Most definitely be a staple for most people. Suitable for every skin tone too. Abh smashed it yet again. Хорошо пигментированы, прекрасно тушуются, оч. нравятся эти тени! *** Well pigmented, perfectly mixed, very good. I like these shadows! I have all the palettes since Modern Renaissance except the Sultry and I think I like this one the most.I love the Modern Renaissance, but I think I am the only one having problems with it creasing (sometimes) and yes,I own 84 palettes (high end and not) and none of them made this happen except the Modern Renaissance. Beautiful, buttery and soft colours with great pigmentation. You can create many different looks with this palette. It is one of my favourite palettes. This is my fourth Anastasia pallette, though I gave SubCulture to my friend as for me it was unusable and she really liked it, so I know that Anastasia palettes can vary. The colours are beautiful, neutral and I expect would suit most eye colours. The shimmers and metallics for me, apply best with fingers and they blend well, though, like other Anastasia palettes, there is a lot of fall out as the shadows are soft. I still go back to the shimmers in the Modern Renaissance if I want a real ‘pop’ though, as none are like this. I really like this. It’s not an ideal beginners palette though, as I think the colours are all over the place in the palette and would be hard to fathom out where they go on the eyes. I am so in love with this palette and very happy I have it in my makeup collection. The matt is gorgeous, blend beautifully and the shade selection inspires you to create lots of different looks. The shade Love, Wild child and Rose Gold are my favourite. Great buy, highly recommended. A beautiful set of cooler and neutral toned shades. These are very different from Modern Romance and Soft glam as I was wondering if there would be any dupes and there aren’t at all. They all blend beautifully and none of them muddy on the eye, which I found a little bit with a Soft glam. As with all Anastasia shadows, these are soft and heavily pigmented and a little goes a very long way. I have to say I was a bit disappointed with the blue/purple shade soul, which everyone raves about. It’s a bit wish washy, but my only gripe. The colour range is everything but there is fall out. Why are reviews so good? Most of the youtubers love this, I don't. At all. This seems like an "everything" palette as in there are neutrals, mattes, shimmers, and a few fun colours. I like the colour scheme. Soul is very unique and pretty. The mattes are fine but they don't blend well together and look muddy. The shimmers are horrible–they have no pigment, they're flaky and don't even work when my brush is soaking. They're so sheer they look matte. And I like shimmers a lot – I bought this seeing that half of it shimmers. So basically half the palette doesn't work. I love this palette. I love all of ABH's palettes. As always the formula is incredible! Not huge on the purples, but that's just personal preference. What a beautiful selection of whimsical cool tone shades! I’m not normally a cool toned palette girl but I love this!! I have blonde hair and blue eyes and normally colours like this wouldn’t really suit me or make my eyes pop, however, THEY DO. Normally the soft glam and modern renaissance suit me better but nopeeeee, love the Norvina one so much.